Summary: The third part of Joel Kratzke's Seeking After a Sign series. This article is part of a series. We recommend that you first read: Seeking After a Sign - Part 1, Spring 2013: Seeking After a Sign - Part 2. What Will Keep You Out of Heaven? My friend then had me turn to Acts chapter two, where the disciples spoke in tongues. He concluded that this tongue-speaking was the baptism of the Holy Ghost. I thought for a moment and then asked if we could go back to Acts chapter one for some context. For John truly baptized with water; but ye shall be baptized with the Holy Ghost not many days hence. When they therefore were come together, they asked of him, saying, Lord, wilt thou at this time restore again the kingdom to Israel? And he said unto them, It is not for you to know the times or the seasons, which the Father hath put in his own power. But ye shall receive power, after that the Holy Ghost is come upon you: and ye shall be witnesses unto me both in Jerusalem, and in all Judaea, and in Samaria, and unto the uttermost part of the earth. 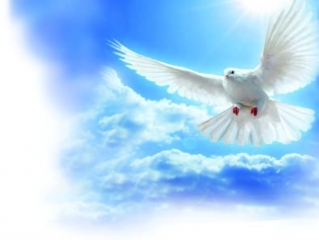 As Jesus gave His disciples a commission (you and I were also included), He stated why the power of the Holy Ghost would be given: “But ye shall receive power, after that the Holy Ghost is come upon you: and ye shall be witnesses unto me.” This is wonderful! It is in perfect harmony with the rest of Scripture in regard to the work of the Holy Ghost. Jesus’ commission to the disciples was to be witnesses unto Him, and this is exactly what the disciples were. The gift of tongues was given to provide the ability to communicate those wonderful words of truth to those who were in Jerusalem from other countries. Tongues: Ecstatic Gift or Understandable Language? So then we come to another question in our study of tongues, that being, What do we do with the references in 1 Corinthians? What does Paul mean when he speaks of tongues of angels? How does this line up with our Biblical understanding so far? Carefully read 1 Corinthians 13:1. I am often referred to this passage as evidence for ecstatic tongues being a gift of the Holy Spirit. The only problem with that is that the context of the entire chapter is love, not tongues. Additionally, “tongues of angels” could be seen as poetic, but I prefer to take it literally. Do angels have a language? Most likely. Follow after charity, and desire spiritual [gifts], but rather that ye may prophesy. For he that speaketh in an [unknown] tongue speaketh not unto men, but unto God: for no man understandeth [him]; howbeit in the spirit he speaketh mysteries. But he that prophesieth speaketh unto men [to] edification, and exhortation, and comfort. He that speaketh in an [unknown] tongue edifieth himself; but he that prophesieth edifieth the church. I would that ye all spake with tongues, but rather that ye prophesied: for greater [is] he that prophesieth than he that speaketh with tongues, except he interpret, that the church may receive edifying. Now, brethren, if I come unto you speaking with tongues, what shall I profit you, except I shall speak to you either by revelation, or by knowledge, or by prophesying, or by doctrine? And even things without life giving sound, whether pipe or harp, except they give a distinction in the sounds, how shall it be known what is piped or harped? For if the trumpet give an uncertain sound, who shall prepare himself to the battle? So likewise ye, except ye utter by the tongue words easy to be understood, how shall it be known what is spoken? for ye shall speak into the air (1 Corinthians 14:1-9, emphases added). The idea that tongues is a language not understandable by the hearers, nor the speaker, fails to consider this Scripture. Any doctrine must be based on an overall agreement of the entirety of all relevant Scriptures. Who Benefits from the Gift of Tongues? To be given a gift that does not benefit those that do not know Christ is no gift, but a hindrance. To be filled with the Holy Spirit is to have the Spirit of God moving upon your conscience and your will. Evidence of that Presence will be seen in a life that grows ever closer to the ideal set forth by Jesus Christ Himself. We may stumble, we may falter, but if our lives are given over to the control of the Holy Spirit we will get up, and move forward, realizing our desperate need of Christ in every area of our life. The gift of tongues is a true sign, but only as it is expressed and used according to the parameters of God’s unchanging Word.